FURNITURE FEATURE –Our exciting Premier Express dining room collection has arrived! We have four options in our quick ship program. The collection I am featuring today is a 42″x60″ oval table with 2 self-storing leaves done in wormy maple. The complimentary dining chair has a beautiful curved back with lumbar support and is shown in brown maple. I would love to show you our vast selection of custom dining room options. Stop by the Poughkeepsie showroom and ask for Al or call 845-778-1500 for more information. -MONDAY’S PICK OF THE WEEK- This week’s pick is from Pete. This gathering table is displayed on all 3 of our showrooms. It comes 77″ or 118″ long and can be paired with many different bar stools as shown. The reclaimed pine top and base have natural cracks and knots which is accented by the iron bolt hardware, giving a nice rustic transitional look. If you have any questions or would like to purchase this week’s highlight, call 845-778-1500 and ask for Pete, or stop by the Walden showroom where he will be happy to show you this week’s pick of the week! The casinos are coming, & so are the savings! Have casino-themed fun at our Annual Floor Sample Sale this year! Our showrooms are “decked” out with dice & cards, games & prizes. 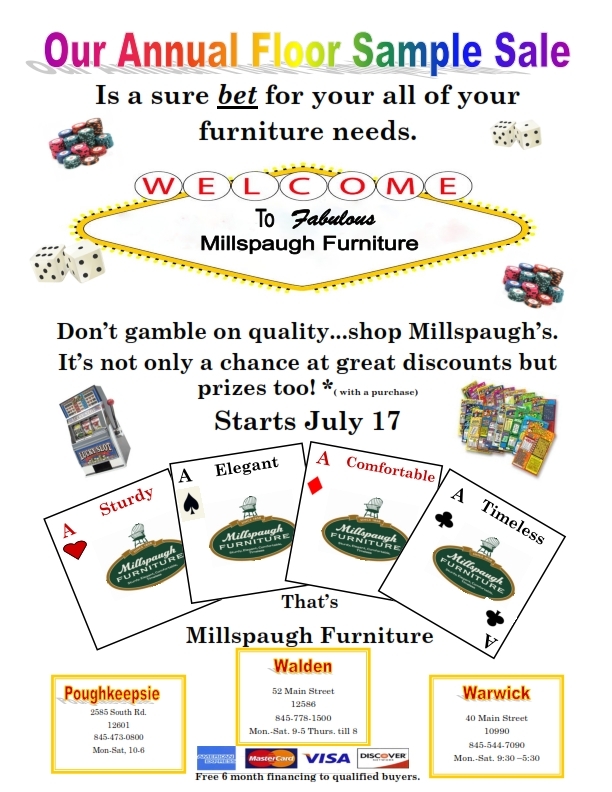 Don’t gamble your money away with disposable furniture, buy local, solid wood and American made furniture!